A rush hour fatality involving a tractor-trailer occurred early Wednesday morning in Gwinnett County, Georgia on Highway 316. Although the accident remains under investigation, it is believed that the driver of the tractor-trailer truck did not allow enough room when turning left from Highway 316 onto Hurricane Trail. Anvir Karim of Dacula, Georgia was not able to stop his Nissan Maxima before striking the rear of the tractor-trailer and becoming wedged underneath in an under-ride accident. It took over an hour for rescue workers to cut Karim free from the wreckage. Sadly, 68-year-old Karim later died from his injuries at Gwinnett Medical Center. Gwinnett County Police Department is still investigating the accident and charges are pending against the tractor trailer driver. When a smaller car or truck is involved in a trucking accident, the results are often deadly. Out of the 500,000 tractor trailer wrecks annually in the United States, about 10% result in fatalities. Most fatalities occur during under-ride accidents when a car enters below the bottom of the trailer of an 18-wheeler during a collision. The height of the front portion of a regular passenger car is about 20 inches below the trailer's bottom and not high enough to contact it, so the bottom bed of the trailer ends up being about equal to shoulder level with the passengers in a car; this has deadly results. When under-ride accidents do occur, they tend to result in very serious life-threatening injuries such as amputations, and they often result in wrongful death. Steps have been taken to prevent under-ride crashes by federally mandating the installation of reflective tape on the sides and rear of tractor trailers and rear guards on the rear of trailers. Even with these safety precautions, under-ride crashes still occur. - Pay careful attention to tractor-trailers making they are making wide turns and U-turns. Sometimes, tractor and trailers will be straddled across roads. - Do not tailgate a tractor-trailer. Rear guards can fail during crashes--especially if the crashes are high speed. - When weather is foggy, slow down and use caution. 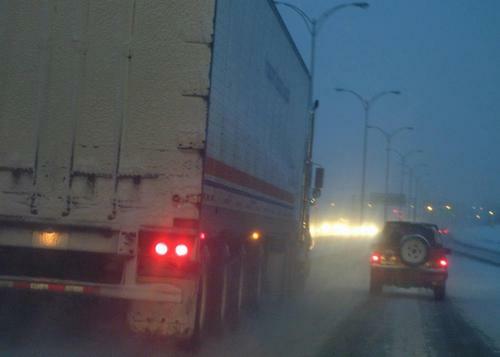 Fog may mask a trailer until it is too late to stop. - When road conditions are wet or icy, your stopping time will be increased. If you don't stop in time for a tractor trailer, you may end up underneath it. - Ambient lighting from electric and commercial lights may reflect off tractor trailers and cause a type of camouflaging, especially if the truck is metallic. If you see light reflecting back, slow down until you can see clearly. - Bad lighting on roadways at night can make the trailer portion of a tractor trailer difficult to see; it is even harder to see the trailer at night if it is a dark color.